Automation is coming, but can R2-D2 change oil? The addition of robots in the service area could transform dealerships' fixed operations. Imagine an oil change in a dealership service lane completed in minutes and needing neither a lift nor a trench. 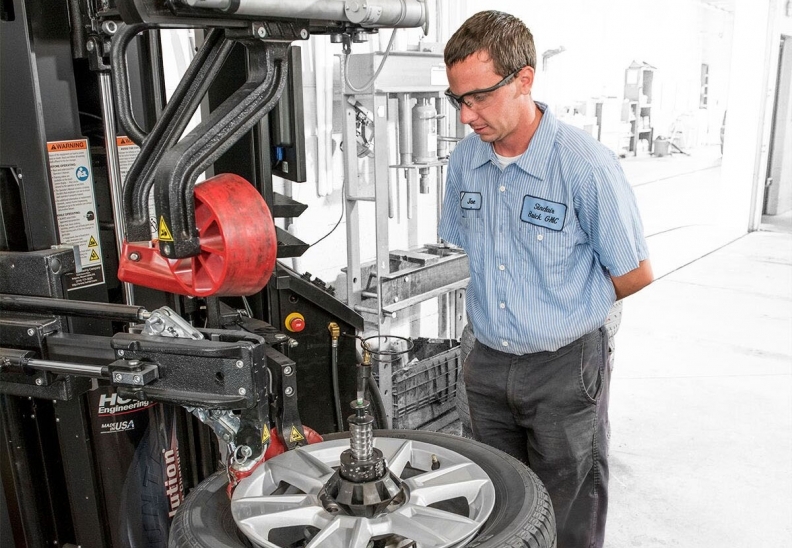 Or a tire rotation done — hands-free — while a service tech works on another vehicle. A customer needs new tires? No problem. Park the car in the bay, input some data, and watch as a highly paid service technician moves on to deal with issues that require more of his brain and less of his brawn. A mushrooming revolution in robotics — a revolution that promises to alter an estimated 95 per cent of occupations in the broader economy — could make these things not just possible, but a reality in dealer fixed operations. Robotics promise dramatic improvements in productivity, consistency and safety for dealer service and parts operations. The technology potentially could transform the way service technicians do their jobs, and it would allow techs for the first time to use their senses and minds far more than their hands. But will these potentially​ expensive machines — new tire mounting machines, for example, can run US $30,000 — improve profitability enough to justify their initial development? That remains a multibillion-dollar open question, and the question likely to determine just how deeply the coming robotics revolution will take root in back-end shops. "The timing might not be as near term as some people might imagine," explains Mehdi Miremadi, co-author of a comprehensive January report by the McKinsey Global Institute on the future of automated work across the global economy. McKinsey & Co. is a global management consulting firm, which has three locations in Canada, too. Miremadi studied job functions in automobile dealerships and found that between 30 and 50 per cent of the work currently being performed by humans could conceivably be done by machines in the future. While that might seem like a huge potential productivity gain in favor of automation, Miremadi cautions that an impeding factor is likely to stifle development. "Technology has to be cost competitive with human labour, and right now technology in its current form is simply too cost prohibitive," he said. "Also remember the economy has to make room for the new jobs and skill sets that will be necessary to operate and program these machines." The McKinsey report, "Harnessing Automation for a Future that Works," released in January, is one of several recent studies to warn of a coming major disruption to the global economy caused by automation and advancements in robotics. The report predicts that — given only currently demonstrated technologies — an estimated 95 per cent of occupations could be affected by automation within the next fifty years. The degree of automation will vary widely by occupation. For example, fewer than five per cent of jobs were found to be candidates for full automation, the study found. But most strikingly, the study estimates that "about half of all the activities people are paid to do in the world's workforce could potentially be automated by adapting currently demonstrated technologies." Globally, that translates to US $15 trillion in annual wages up for grabs. The Revolution Tire Changer, developed by Hunter Engineering, automatically mounts a tire to a wheel. The most susceptible jobs to automation are those involving physical work "in highly structured and predictable environments," such as unskilled labour in factories, as well as data collection and processing jobs, the study said. And the time line for this massive switch? "Our scenarios suggest that half of today's work activities could be automated by 2055, but this could happen up to 20 years earlier or later depending on various factors, in addition to other economic conditions," the study said. At auto dealerships, a sea change in operations is already in its early stages. In sales, some easy functions — inventory management, for example — have already been automated. Soon, robots, perhaps in the form of autonomous cars, might come when called for a test drive, and then park themselves with mathematical precision when the test drive is complete. McKinsey & Company analyzed the impact of automation across 54 countries covering 78% of the global labour market. The goal was to assess the per centage of time spent on activities with the technical potential for automation. In finance and insurance, automation can streamline operations even further than they already are, but the technology is unlikely to fully replace the selling power of human interaction,​ says Inga Maurer, the partner co-leading McKinsey's automotive dealership consulting business. And in service and parts? Robotics can transform the way service technicians do their jobs. "There's definitely an openness," among dealers to the benefits of automation to support service technicians, Maurer says, "especially given that certified trained techs are hard to come by. Dealerships are already trying to capture labour efficiencies and exploring ways to deploy more technology. "But," she adds, "there's probably 10 more years of incremental improvement before you see automation pilots in the field" establish a sustainable beachhead within fixed operations. Before semi- or fully autonomous robots ever take their place alongside the lift as indispensable tools in the service bay, those robots have to first be designed, developed and funded. And for that to happen, equipment makers have to see opportunity. Automakers, including Hyundai and Honda, are already experimenting in robotics: Honda's humanoid Asimo robot, or Advanced Step in Innovative Mobility, has been under near constant development since 1986. And Hyundai has been developing an Iron Man advanced exoskeletal suit that would help workers perform physically demanding tasks. 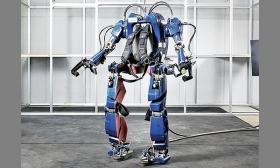 Hyundai is developing an "Iron Man" exoskeletal suit that would help service workers perform physically demanding tasks. "Jobs that are dirty, dull or dangerous; in the industrial realm, that's where we sell robots," says Claude Dinsmoor, general manager for general industries and automotive segment at industrial robot maker Fanuc Robotics America. "And when we look at a service bay, it's not much different than a general assembly area of [an auto assembly plant], although it may not be as clean. But I'm seeing a lot of the same tools." The automotive industry has been using robotics to build its vehicles for more than three decades, and in that time, the machines have evolved exponentially thanks to advancements such as machine learning and the integration of sensors that help industrial robots see and touch. Such evolution will play out as well when automotive service robots are designed, Dinsmoor said. Dinsmoor said the biggest advancement in robotics in the last five years has been improvements that allow robots to operate safely alongside human workers. "The other thing that's occurred is that the robots have gotten smarter, but not necessarily stronger. We now routinely add machine vision and force-sensing technology so we can touch, and we use software that lets the machine get smarter without someone having to program every possible scenario," Dinsmoor says. "Now we've taken all of this vast knowledge that the auto industry has given us and applying it in the service environment." In a service bay, Dinsmoor says he can foresee "collabourative" robots that might work alongside technicians rather than replace them. "You still have to have the people around. That's going to be the key driver in the service area," Dinsmoor said. "If you put the robot in front of the car or the wheel, it can find the tire and the lug nuts easy enough. Fluid fill becomes an opportunity [for automation]. Those tasks don't take much time for a person, but if you could automate those tasks, that frees up time for the person to do higher-level work. "I think they're going to look different, and they're going to be built with a purpose in mind. It's not going to look like C-3PO. It's going to look more like R2-D2 — something that's purpose-driven," Dinsmoor says. "After 35 years in the robotics industry, we learn every day how sophisticated people really are." Hunter Engineering, a Bridgeton, Mo., auto-service equipment maker, which has its Canadian headquarters in Aurora, Ont., has developed several automated systems for dealerships. But at this point, machines such as its Revolution Tire Changer, a machine that automatically mounts a tire to a wheel, and its drive-over Quick Depth tread depth sensor are more tools than robots. "Eight, 10 years ago, when we were designing the Revolution machine, we were looking at a tech having to use a pry bar to physically remove the tire," said Kaleb Silver, senior product manager at Hunter Engineering. "The technician did a lot of the work there and made a lot of the movements. The machine reduced the risk involved in changing that tire." "I think you'll see Hunter and other companies that are in the marketplace continue to make products that are good for the tech and automate the process without removing the need for human oversight," Silver said. The key to making the technology happen, however, is finding a way to make money on it throughout the value chain. Robotics companies must see a way to achieve a profitable return on any potential innovation. For example, a potential automated oil change machine would not only have to be able to perform the service on a wide variety of different vehicles to be profitable, but also be able to do so better and cheaper than a human counterpart. "In many ways, potential ROI factors into whether you design it. You're always looking for a faster way, a more efficient way," Silver said. "You're looking for all those factors where you reduce risk, the things that cause major losses. ? "You'd want to focus on anything that focuses on speed, efficiency, reduction of risk and customer satisfaction. In a consumer-driven world, it needs to have a positive impact on the vehicle owner as well." 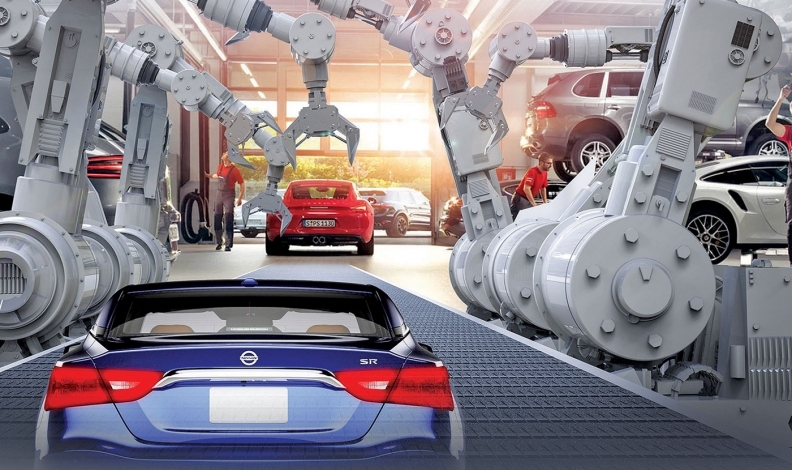 For the companies that will develop robots for dealership service areas, timing will be key. "An oil-change robot would have been twice as valuable 10 years ago as it is today, because 10 years ago you changed oil twice as often," Silver said. Robots may one day rule the service bay, and maybe the world, but not yet. And for now, the best robotics are those that help service techs do their jobs better. An example: Audi of America's introduction of its Audi Robotic Telepresence, or ART, a machine which allows a dealership technician to ring up expert assistance through the use of a video- and audio-linked robot. The ART device is more of a communications tool than an actual robot, in that it requires human operation and can't do more than inspect a problem. "I think in the terms of autonomous robots that work on their own, we don't see that, but we do see the expansion of telepresence," says Brian Stockton, director of Audi technical support. Audi has the top-rated service reputation in the industry, according to J.D. Power. Stockton says that automated machines servicing vehicles will never outshine the abilities and flexibility of a well-trained service technician to diagnose and fix a problem, especially when the technician can call on remotely located experts for help. "We're going to always support our technicians, but we're also going to bring our Audi techs closer to our technical team, and blur that line of information sharing back and forth," Stockton said. While automated machines might save work for skilled employees on some tasks, those machines themselves won't be maintenance free. "The people that are going to rely on robotics in the shop are still going to have to have the same people trained to fix small abnormalities in the robots," says Mark Davis, the automotive programs manager at Seminole State College in Sanford, Fla. "While robots may take away some of that manual labour, it's still going to require a human being" to do diagnosis. Adds Davis: "Right now, to see that type of thing advancing, you're going to have to convince dealers that there's profitability in robotics."